The intrigue starts with Frankel’s reminder of the probable source of the Earnest/Ernest wordplay: namely gay writer John Gambril Nicholson’s 1892 Love in Earnest: Sonnets, Ballades, and Lyrics (Elliot Stock, 1892), which is a hyperbolic (and eventually interminable) series of homoerotically lovelorn verse. 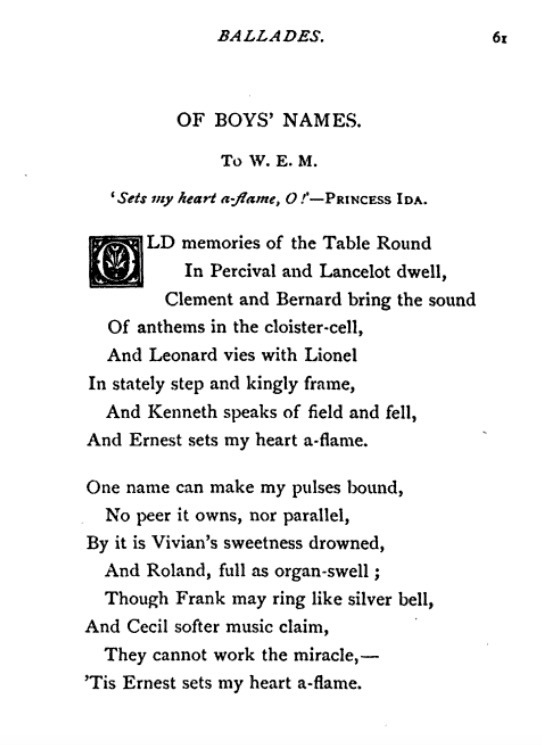 One particular ballad entitled Of Boys’ Names is dedicated to “W.E.M.”, the flaxen-haired, blue-eyed William Ernest Mather (1877–99), which contains the refrain “And Ernest sets my heart a-flame”. 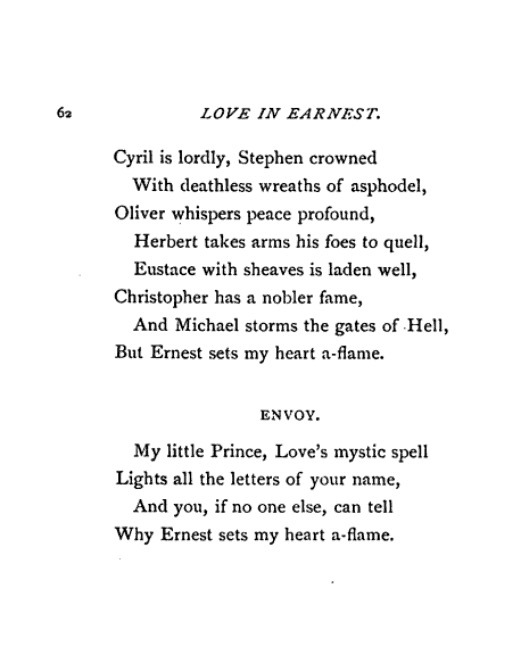 This connection is not new: reference to Ernest as a major dedicatee in Nicholson’s Love In Earnest can be traced back through Edmonds, McKenna, and The Daily Telegraph, at least to Timothy d’Arch Smith’s study of Uranian love in 1970 . To begin with, among the boys’ names mentioned are Bernard (Shaw), Leonard (Smithers), Lionel (Johnson), Stephan-e (Mallarme), Frank (Harris), and Herbert (Beerbohm Tree). Ah but! you will say, those are all commonplace names whose occurrence might easily be coincidental. Besides, they are not all homosexual men. So let us not get carried away just yet. Neither let conspiracists think that Nicholson’s allusion to deathless wreaths of asphodel echoes Dorian Gray (ch. VIII) where Lord Henry said he had buried his romance in a bed the same yellowy perennial. All of these allusions can be planted by the grassy knoll where, perhaps, they belong. But what I find beyond coincidence are two further names in the poem. It is not just that they are more unusual names, they are, no less, the two names of Oscar’s own sons: Cyril and Vivian (which Wilde’s spelled Vyvyan). Surely, their inclusion should give us pause to wonder how this might have come about. Two possibilities emerge. Either Wilde was around Nicholson and suggested them; or Nicholson is directly referencing Wilde’s dialogue The Decay of Lying in which the interlocutors have those names so spelled. One of the reasons why this little curiosity has rarely, if ever, been cited is that Nicholson’s poem is never given in full. So, it’s worth digging it out for a closer look. Here it is. Let me know what you think. The Annotated Importance of Being Earnest, Edited by Nicholas Frankel.